He may be the bookies’ favourite to be the next manager of Bolton Wanderers, but all Chris Wilder is focusing on is a ‘big finish’ to the Cobblers’ campaign. Wilder has been strongly linked with the hot seat at the Macron Stadium, with Wanderers looking for a new manager after their relegation to league one was confirmed last weekend. Neil Lennon was relieved of his duties in March, having endured a torrid time as the Trotters battled against financial meltdown. The club was saved from going bust by a takeover, and Jimmy Phillips has since taken on caretaker duties, but new chairman Ken Anderson has made it clear he wants somebody else long term. 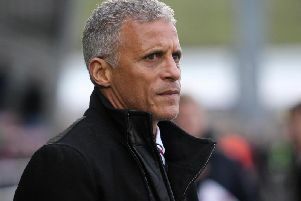 Anderson has stated this week he has a short-list of three managers and it is being widely reported by media in the north west that Wilder is a man of interest to Bolton, who will be playing the Cobblers next season after Town’s promotion from league two. Wilder has been consistently linked with other jobs throughout the season including Notts County, Cambridge United and Rotherham United. But whenever his name comes up concerning another job, Wilder always insists he is happy at Sixfields and that he will just ‘get his head down and carry on’. Wilder is on a one-year rolling contract with the Cobblers, and the Chron understands there is nothing in the stories linking him to Bolton, and that it is business as usual at Sixfields this week. The Town boss is concentrating on preparing his team for Saturday’s trip to Exeter City, and there was certainly nothing else on Wilder’s mind on Tuesday when he spoke about his hopes for the remainder of the campaign - setting his sights on winning the Sky Bet League Two title. “We are really focused, focused on having a big finish,” said Wilder, who saw his team guarantee promotion with a 2-2 draw against Bristol Rovers last weekend. “Results wise, we have had three draws on the spin and they haven’t been the results we have wanted because we want to win. “But, we are looking for that big finish because we want that championship, there is no doubt about that. “The players, myself and the staff have our sights firmly set on winning the division, and being the best team in the divisiom. “We have had a lot of plaudits, a lot of people have sung our praises, but now it really is a focus on going on and winning the championship and I am sure we will do it. “We have got difficult games to play, and the other teams have got difficult games if they want to catch us, but I am sure when we do it, the next focus will then be on finishing the season on a high.